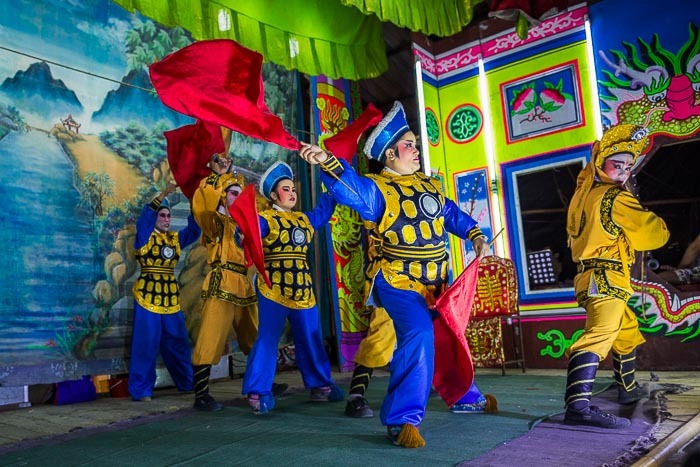 The Sing Tong opera troupe performs in Bang Luang, Nakhon Pathom province. I went to a Chinese Opera in Nakhon Pathom province last weekend. It's Chinese New Year, which is the "high season" for Chinese operas, and I desperately wanted to get out of Bangkok, even if for only a couple of hours. When I found out an opera troupe was performing in Bang Luang, about two hours from Bangkok it was time for a road trip. 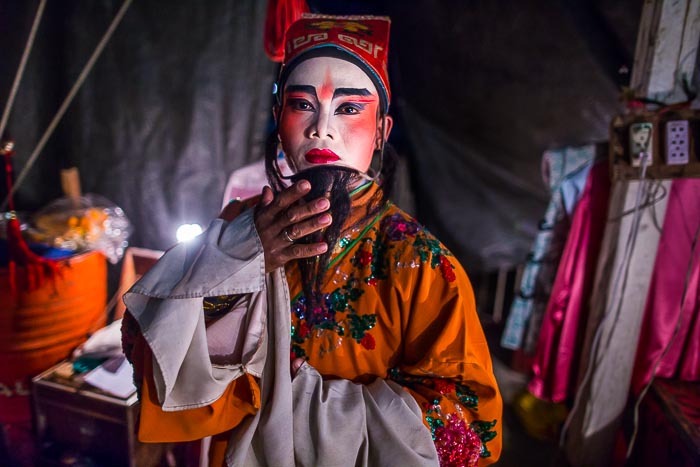 Chinese opera has been a part of Chinese-Thai life for centuries. There are millions of Chinese-Thais and the opera provides a link to the old country. Chinese opera in Thailand is usually sung in the Teochew language. Not many Thais, not even Chinese-Thais, still speak Teochew. Some of the performers don't even speak it - they learn their parts phonetically. A performer gets into character backstage. Chinese opera's popularity in Thailand is waning. The makeup, dramatic lighting, flowing costumes and intricate sets make for a wonderful visual spectacle but the language (Teochew, not understood by many Thais), the length (four hours is not unheard of) and the "leisurely" pacing (when I told a Thai friend I was going to Chinese opera he said something like "ugh. I don't like Chinese opera - too slow.") work against it. More and more people are watching their Chinese operas on bootlegged DVDs and VCD (Video CD) or forsaking the opera altogether in favor of movies and the internet. Chinese opera is losing popularity, even as other musical art forms, like mor lam, are gaining popularity. At the show in Bang Luang the audience came and went depending on their interest in the show. Sometimes there were five or six people in the crowd. Other times nobody was watching. All during the show though, people came to the temple (the opera was performing on the grounds of a Chinese temple) to pray, make merit and leave offerings for the temple. Driving back to Bangkok we passed a second opera. I stopped to photograph for a couple of minutes as they played in a market parking lot. For just a few hours it was a chance for me to forget about the increasing political madness gripping Bangkok. This was my third Chinese opera. I enjoyed the third one as much as I enjoyed the first. 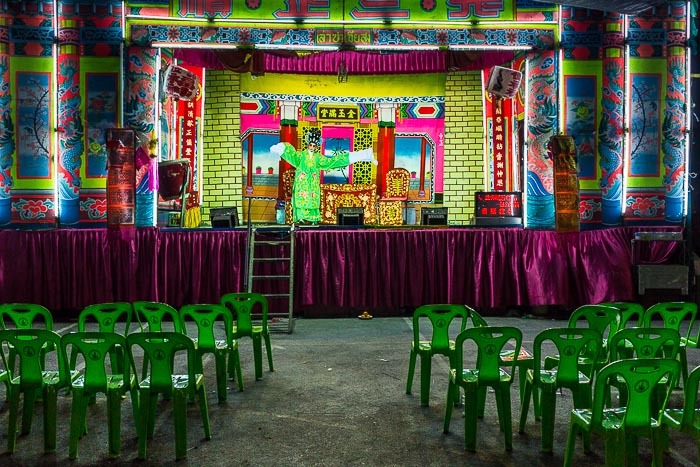 For a photographer it's hard to find a subject with more variety, color and rich backstory as Chinese opera. I don't understand a word of what's sung on stage, but the spectacle more than makes up for my lack of understanding. There are more photos of the opera in Bang Luang in my archive (along with photos of other Chinese operas).